I went a 3.5" wide front with a 120 tyre and 5" rear with a 160 and to be honest the tyres a tight fit. If you go this size in the rear be careful what brand of tyre you get because there are some that are too wide to fit even if they are labelled a 160. That's what I seem to be finding out. that 5" with a 160 will have chain rub without a different chain guide. May go with the 4.25 and a 150 then. Have you done any suspension work with your bike? 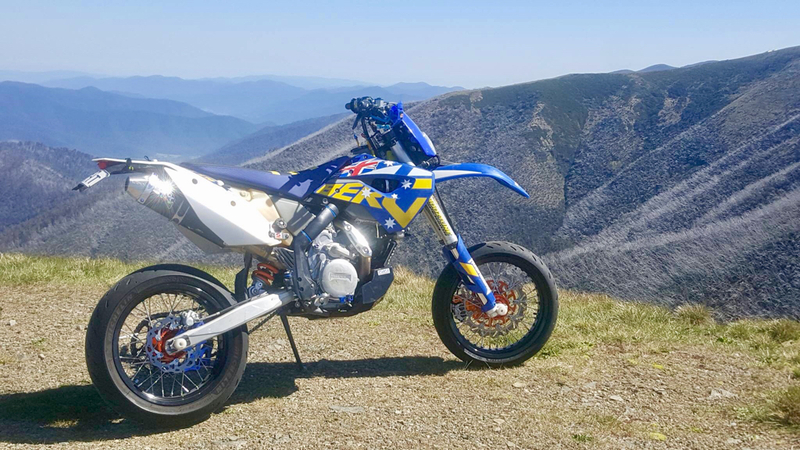 Ive read that the stock FE suspension is too soft for the supermoto rims/tires and bigger brakes. Also what brake setup did you go with? In all honesty its a dirt bike 1st and motard 2nd so the suspension is still dirt valved and just has springs to suit my weight. It does dive a lot in the front under heavy braking but i havent experimented with the clickers much yet. My 1st track day (local go kart club track where the local motard club races) i binned it and stuffed my knee quite bad and have yet to go back for another play. My brake is a 320mm with an adapter to suit the standard caliper. Its fine on the road but it did fade after 10 mins on the track. Id stick with the 5.00” rear. More serious/race rubber is a tad narrower then your average road tyre. My chain chews the tyre but everyone goes through that. The chain guard has a chain guide but it doesn’t prevent contact completely. You can buy the guide on its own and not expensive. Slips under the end of the chain slipper and screws into the provided hole. Max out your suspension clickers. AliExpress have cheap 320 disc setups that work great. The 70* Bergs are very loose in the front end on bitumen. Money can solve this though. When i did some tard racing id loose the front end. When i borrowed a mates bone stock standard FE450 Husky i came second. Night and day. Do you reckon its due to weight bias or just plane ol geometery? Last edited by Gibbo; December 8th, 2018 at 09:36 PM. 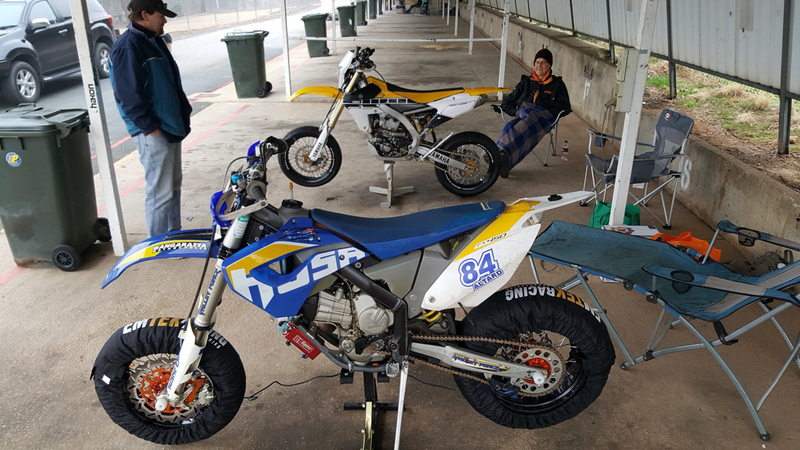 Mates with a YZ450 and a FC450 fitted motard wheels and went racing. Couldnt do the same thing with the Berg. Firmer suspension, shorter front forks which would shift weight bias and steepen the rake. Less offset to bring the trail back and shorter swingarm helps. Its alot to go through to get a bike to handle near/like the bikes above. The full on FS motard by Husqvarna apparently handle amazingly. Id like to take a FS450 Husaberg to see how they handle differently.